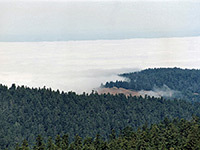 Although Redwood National Park has the most important designation of the four redwood parks, and covers more land than the other three (Del Norte, Jedediah Smith, Prairie Creek) combined, it receives fewer visitors, is less developed and contains really large trees in only scattered locations; also, much of the land is quite inaccessible. This is partly due to its more recent creation (1968), after most of the original redwoods in the area had been cut down, leaving old growth trees only in a few hard-to-reach locations. 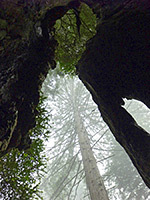 The scenic, more easily accessed redwood groves closer to the coast came under state park protection much earlier, in the 1920s, leaving the more remote inland areas open for logging for another three decades. There are relatively few trails in the national park, and most people see just one location, the Lady Bird Johnson Grove, site of the park's dedication ceremony. 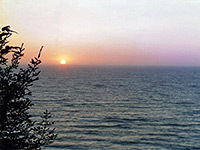 The majority of the park is managed as a wilderness, and is accessible only by long trails that require overnight stays at primitive campsites en route. The main part of Redwood National Park is a single block around Orick (see map), covering hills to the north and east of town, the lower Prairie Creek valley and a 7 mile section of the coastline, but the most interesting area is the large expanse south along Redwood Creek. Access is via Bald Hills Road - paved but in places steep and winding, this climbs from sea level to a ridge over 2,000 feet above the creek, which flows through a deep valley to the west. The road eventually becomes unpaved and exits the park, continuing to Weitchpec in the Hoopa Valley Indian Reservation. 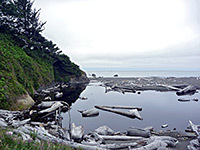 Of the other sections of the park, the next largest is a ten mile strip of land along the coastline either side of the Klamath River estuary, north of Prairie Creek. This has a small selection of trails and the Coastal Drive, a narrow partially paved loop road through forest and close to the edge of cliffs 300 feet above the Pacific Ocean. 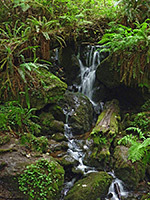 First point of interest along the drive is Redwood Creek itself, and a short track leads to a trailhead beside the stream from where a path (Redwood Creek Trail) follows the valley for 8 miles, linking with other trails that wind through the dense forested slopes at either side. There are three primitive campsites along the way, and this is the main location for multi-day hikes, as most other trails in the national and state parks are too short. Back on the main road, the forest has no redwoods at first but they begin to appear after a mile or so and are plentiful by the time the elevation reaches 1,250 feet and the road passes the parking area for the hike to Lady Bird Johnson Grove. This is an easy one mile loop past the national park dedication site deep in the forest, placed at a ceremony in 1969 attended by the then president's wife. Four miles further and 700 feet higher, Bald Hills Road reaches Redwood Creek Overlook, a promontory giving views over a large area of the valley below, much of which is slowly recovering from timber operations prior to the national park creation. The Pacific Ocean is visible beyond, or at least it is on the relatively few occasions when not obscured by fog. Soon after is the turn off to Tall Trees Grove, reached by a twisting, unpaved road open to only 35 vehicles a day (permits may be obtained from the visitor center). This leads down towards the creek, then a short trail continues to the grove, a region which can also be reached by the Redwood Creek Trail and is home to several of the world's tallest redwoods including one specimen of 367 feet that is believed to be the current record holder. Bald Hills Road continues southwards, along a mostly treeless ridge top, becomes unpaved, reaches a highpoint of 3,100 feet near Coyote Peak, then exits the park. Also in the main section of Redwood National Park is Lost Man Creek - a stream and cascade reached by a short paved road, the Skunk Cabbage section of the Coastal Trail - a 5 mile path through woodland to the sea front which links with Davison Road in Prairie Creek Redwoods State Park, the Trillium Falls Trail to a small waterfall in a section of old growth redwood forest, and Freshwater Lagoon - one of the three Humboldt Lagoons, this is separated from the ocean by a beach which is notable for the huge logs washed up by winter storms; this region must have the largest driftwood of any coast in the world. 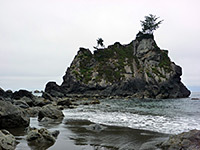 The sands are close to US 101 and so easily accessed, and one of two park visitor centers is located right on the shore. The Klamath River unit of the national park also contains part of the Coastal Trail, reached by two sections of narrow road either side of the river - Klamath Overlook to the north and the Coastal Drive to the south, both of which are unsuitable for large vehicles. The one highway-side NPS facility is at Lagoon Creek, along US 101 just north of the Trees of Mystery (a commercial enterprise with a Native American museum and a short trail to some unusual redwoods). Beside a lily-pad covered lagoon is a parking/picnic area, from where paths lead into the adjacent forest, linking with the Coastal Trail to Hidden Beach.